Robertson, Raleigh J.. "Meadowlark". The Canadian Encyclopedia, 25 March 2015, Historica Canada. 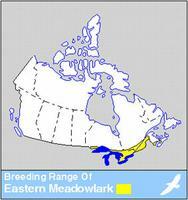 https://www.thecanadianencyclopedia.ca/en/article/meadowlark. Accessed 23 April 2019. The meadowlark is a robin-sized bird with a bright yellow breast marked by a black crescent. 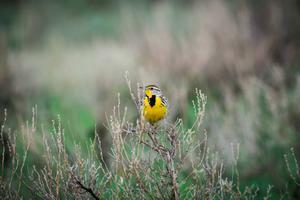 The meadowlark is a robin-sized bird with a bright yellow breast marked by a black crescent. Like blackbirds and orioles, it belongs to the Icteridae family. Two species occur in Canada. Although their appearance is very similar, their songs are distinct. The western meadowlark (Sturnella neglecta) has an elaborate, flutelike song; that of the eastern meadowlark (S. magna) is a shorter, clear whistle. 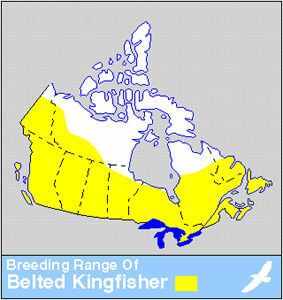 The former species occurs from the West Coast to eastern Ontario, the latter from central Ontario through the St. Lawrence Valley. The eastern meadowlark ranges south through Mexico and Central America to Brazil. 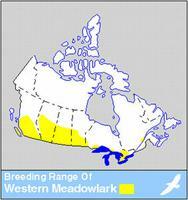 Although some meadowlarks winter in southern Canada, most migrate a few hundred kilometres south. Meadowlarks nest on the ground in open grasslands, laying 3-7 eggs in a well-concealed, domed nest. They feed on insects during the breeding season and on weed seeds in fall and winter.